Memorization of music has always been something that I’ve struggled with. I think in part I’m not as good at it as many of my musical peers, and I also have study methods don’t lend themselves to memorizing. I don’t like tedious work where it’s difficult to see progression. Memorizing can be very intangible, where you’ve memorized something one day, only to have it disappear the next. While discussing singing with a friend recently, I noticed that she seemed to have a much better idea of the structure of her pieces that I do. This kicked off some inquiry and thought on my part. Perhaps I’m just memorizing wrong. I’ve always used a brute force method as opposed to working within a framework intended to aid memorization. This seemed like a simple way to learn music, not memorize it though. Yet when I asked, this was the response for the best way to memorize. I suspect the reason this slow and methodical approach works is because it allows you to get it right the first time. Relearning incorrect notes can be extremely time consuming and difficult. This method also allows for methodic repetition of the words, rhythms, and notes which create a good baseline for memorization. In addition, you have to know how to sing something correctly before beginning to memorize it. This process may actually be enough for some musicians to memorize a piece, but for myself, I need a bit more work. Research on memory shows that humans do much better in memorizing lists or random items when they are able to provide some structure to the data they’re attempting to recall. By chunking (or dividing into pieces) we can often memorize much more information at a time. One good example is that of a phone number. Take this fake number for example: 4065551242. Trying to memorize that all as a string of 10 digits is hard. Yet dividing it up, like this: (406) 555-1242, and memorizing the 3 pieces as separate pieces makes it easier. For a piece of music, breaking it into sections or even further into phrases should aid the memorization process. Extending on this technique, creating distinction or categorizing the chunks will allow you to more easily remember the chunks. For example, if you remember that there is a fast section, then a slower one, then a repeat of the first fast section with a modification in dynamics, those three things create a basic structure on which you can fill in pieces more easily. Look for chord patterns, texture changes, tempo changes, dynamic changes, repeated sections, modal differences, etc. to categorize phrases or larger sections of music. A final skeleton-building technique is to memorize the meaning and emotion behind the song. If you can learn the broad feelings, or better yet, the actual line-by-line translation of the piece, it will provide a great framework to begin memorization. Probably the most common method of memorization is simply rote learning, or learning by repeating. Often singers will listen to a piece over and over or sing through a piece, or parts of a piece, numerous times to engrain it into their mind. I’m fairly certain that every singer uses this technique to one degree or another. Tip: I find it best to learn a piece this way by starting with the final phrase and working my way back through the song, stringing it together as I go. For example: memorize the final phrase, then memorize the second to last, then memorize those both together, and move backwards using this technique. This works well because it forces repetitions and it’s comforting to know that if you can get started in a performance, you’ll improve as you sing through your piece. We all have sticking spots in every song that we’re learning. They might be difficult sections, or they could just be seemingly random sections that we get caught up on. For myself (and I suspect others) there is a definite tendency to want to just run through these parts and ignore the fact that I’m struggling. It’s a lot more fun to just sing the parts I know well. This is a bad plan though. You should work these parts until they become the best part of the piece for you, otherwise you’ll either learn a mistake or this problem will crop up again during a performance. Trust me, I’ve had that happen more times than I’d like. Research has show that taking naps or sleeping between study or memorization sessions improves memory retention. Also, more shorter sessions are typically more valuable than one long session. Don’t simply repeat your music, try to recall it. This could be something as simple as reading a line and then looking away and attempting to recall. It’s been shown that your brain behaves differently while recalling vs. simply reading. 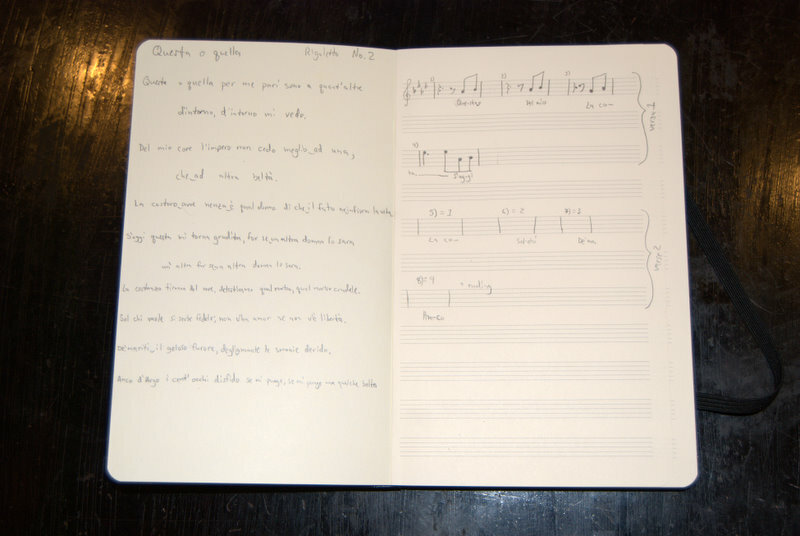 I bought a moleskine notebook with music ruling on one side, and I’m going to use it to break down pieces into cues. The sheet will have the first few notes of each phrase on one side with the accompanying words. Once I have a general understanding of a piece, I’ll then use that structure to cue me as I try to recall the piece. Once I’ve memorized the piece with only those notes, all I have to do is memorize those phrase beginnings. I’ve essentially chunked the piece into parts to make them more consumable. I also plan on writing in a translation and the lyrics on the page across from the phrase beginnings and will be including any structural notes I have (as mentioned above from analyzing the piece). I’m fully willing to admit that this isn’t going to make memorizing easy or trivial, but hopefully it will be a good starting point to improve the amount of time it takes for me to memorize a piece. A wise voice teacher once told me when asked how long it takes him to memorize a piece: “As long as it takes.” Let’s just hope that it won’t take as long.